Almost a month ago Naxals killed over 70 Indian Army soldiers in a big attack and now they have launched another major attack in Dantewada City of Indian killing over 50 People. In the attack more than 20 Police officers are also killed while others are civilians.According to Indian News Channel NDTV the attack was done on a Bus in which all of these People including Police officers where sitting. There are many forests and attack is also done at evening time which will make rescue works more difficult. Naxals have turned into a major Threat for Indian State and they have carried out some massive attacks in India in last few months. on 6 April 2010 more than 70 Indian army Soldiers where killed in their attack. The Chief of Naxals has claimed that we are so powerful that we will be able to take over Delhi until 2012. 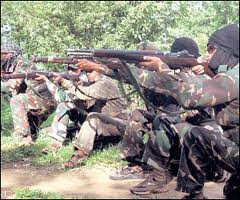 Till now Naxals have spread in several States of India.